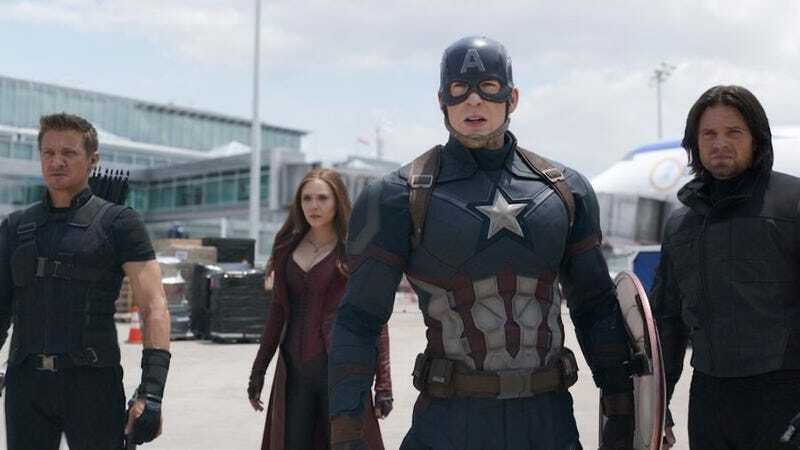 With the release of Avengers: Endgame upon us in less than two weeks, some fresh-faced fans might be looking to catch up or refresh themselves on the 21 previous MCU films. One possible method of doing so is to hit up an AMC for a psychotic 59-hour marathon, an option we at The A.V. Club formally do not endorse. For those not looking to Hulk-smash their brains into a smooth paste, Endgame directors Joe and Anthony Russo have helpfully listed which Marvel movies they think are essential viewing going in. Surprise, it’s the ones they made. If you somehow had an interest in seeing Endgame despite never having watched a Marvel movie, seeing just these three would be a reasonable choice. The current state of affairs is probably more easily inferred via the Russos’ previous MCU films than by watching the last three movies with “Avengers” in the title. Plus, you get to see two very good Marvel movies and another mostly okay one. Above all, we’d recommend not worrying about it too much. Even among those who’ve seen all the previous Marvel films, part of the experience for casual fans will inevitably involve trying to remember, say, who Martin Freeman’s character is supposed to be. Watching just three of 21 films most likely won’t help you parse what the deal is with Benicio Del Toro, but it’ll give you the general idea of who is fighting whom and why. Those looking for next steps after the Russo’s recommendations would probably do well to check out Captain Marvel, since it’s still in theaters and she seems to be in the trailers for Endgame a bunch. You probably do not need to watch Thor: The Dark World or Ed Norton as The Incredible Hulk, but you should still read our recent essays about them. How much healthier is white-meat chicken than dark-meat?